Clearly the BEST deal for a body, hands and face lotion on the market! 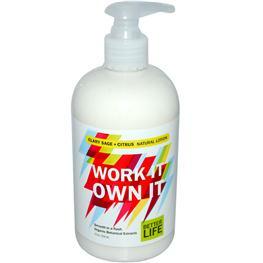 Better Life’s “Work It, Own It” Clary Sage and Citrus Natural Lotion. I am super fussy when it comes to what I apply to our largest organ of the body and this passes with flying colors. The put-it-wherever-you-want-it lotion is pH balanced with no mineral oil, parabens or synthetic anything. Light, pleasing aroma (no artificial stink here) from lemons, oranges, cucumber and a touch of earthy sage. Shea butter adds richness as do the avocado and coconut oils. Best part? You can get it for $4.99 a POUND in the bulk section of Food Front. Bring in a jug or buy a 2 oz travel tube for $1.49 and fill it up for less than 85 cents. Now that’s a clear deal. Click here for ingredients or to order in a 12 oz pump bottle online from iHerb.